Samarpan Diwas was observed remembering the founder or Jan Sangh Pt. Deendayal Upadhyay on his death anniversary. 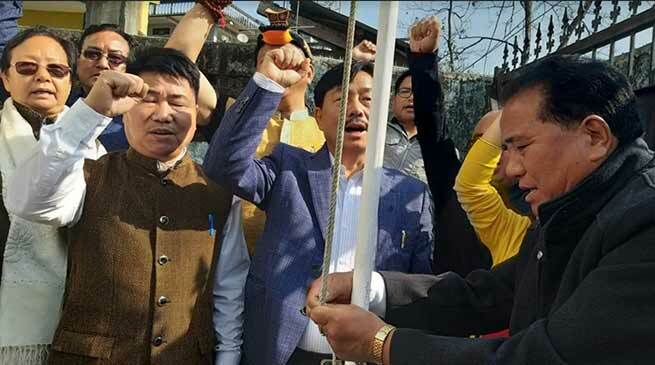 State ruling BJP party today observed Samarpan diwas at its headquarter in Itanagar with lots of programme and awareness on the responsibility to donate selfless service for the cause of nation. The Samarpan Diwas was observed remembering the founder or Jan Sangh Pt. Deendayal Upadhyay on his death anniversary. The program started with the flag hoisting by the State BJP President Tapir Gao along with Ministers, MLAs and party karyakartas then followed by paying shradhanjali to Pt. Deendayal Upadhya. Addressing the function Gao said that, the first responsibility is to take care fo the family, community and society as well as to see that the act is also attached with the welfare for community and development. All need to shoulder his/her responsibility for nation development and asked all the party karyakartas present to follow the ideology of Antodaya and Manavaat Ekatma to uplift our society and nation.